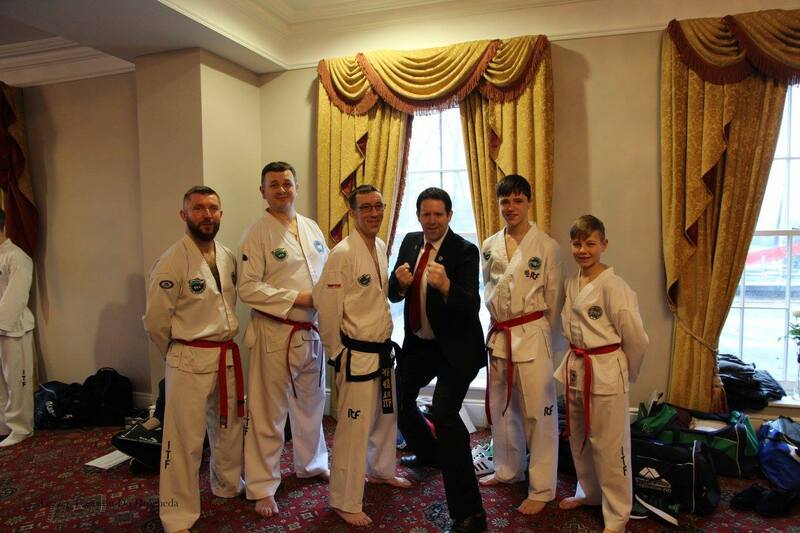 The INTA Winter Black Belt Grading was held on 2 December. From 9 o'clock onward, parents, instructors and nervous students gathered in the CityWest Hotel. Grand Master O'Toole, Master Douglas and Master Martin were on the panel for the twelve students grading to second degree and above, which took place in the bright first floor Conservatory. Master Donnelly led a panel of five senior instructors, including Master Fagan, in the adjacent much larger Ballroom; here 20 black tags presented themselves for their grading to first degree. Both gradings got underway as scheduled by 10 a.m. After the student oath, students were dismissed and called forward in groups no bigger then four, to test movements up and down the floor, patterns, step sparring and self defence techniques. This was followed by sparring, after which all students were called to the table individually to be tested for their theory and power. After deliberation by both grading panels, all students lined up together in the Ballroom for the results. Master Donnelly read out the names of those who passed, while Grand Master O'Toole presented the 17 new first degrees and one fourth degree with their black belts. We wish to congratulate all those that passed. We hope to see the few that didn't pass again on 9 June 2018. We wish to thank Master Martin and Ms McCarthy for their diligent work preparing this grading, and Mr Carberry for organising the event.